He balances his own story of attempting to become healthier with the poignant deaths of two family members that occur during the two years researching and writing the book. These scenes remind us that no matter how hard we try to live a healthy life, death gets us all in the end — but that’s no reason not to try to live life to the fullest while we’re here. Family life makes frequent appearances in this book, as Jacobs attempts to apply his health rules to his three young sons and sometimes (when she’s willing) to his long-suffering wife Julie, who by now (based on anecdotes in this and the previous books) must surely be a candidate for sainthood, or whatever the secular Jewish equivalent is. 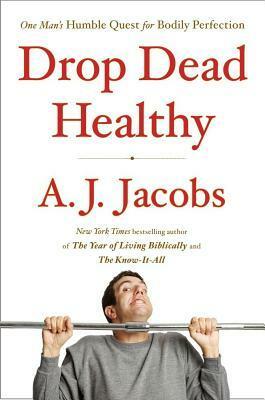 Most of us would not want to attempt everything Jacobs attempts in this book — nor live with someone who does — but it’s great to have a writer as engaging and witty as Jacobs to forge the path for us, clear some of the underbrush, and demonstrate that living a healthier life really is possible. He almost convinced me to get a treadmill desk. But walking around wearing huge noise-cancelling headphones? Ain’t gonna happen.